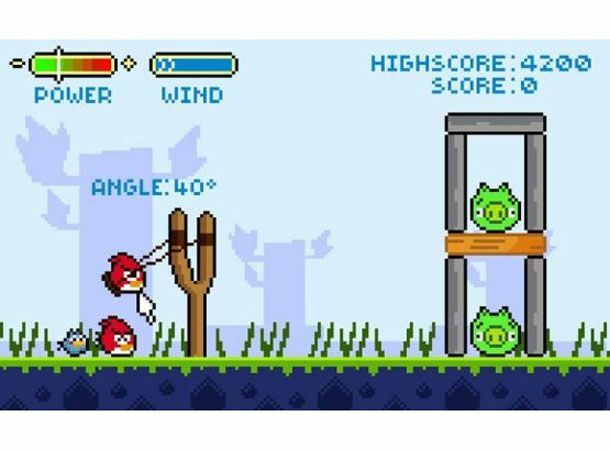 Apple's top iPhone app of the year Angry Birds has been given a retro '90's makeover as the miffed feathered warriors fly back to the days of mass pixilation. A number of mocked up screenshots have emerged from Penney Design with the feather app phenoms being displayed as they would have looked if created back in 1992. As well as having the classic jagged edged, visible pixel appearance the Angry Birds throwback features enough nostalgia to make you feel all warm inside. Sadly nothing more than a series of unplayable single screens, the 90's style Angry Birds features an on-screen cursoras well aspower, wind and angle gauges, all necessary preludes to the current era of touchscreen interfaces. Whilst there is currently no sign of the 90's throwback being turned into a playable release, something we hopechanges in the near future, Angry Birds creator Rovio today announced that its bird catapulting, pig squashing, egg salvaging app has now been downloaded more than 50 million times across all mobile platforms. Would you play a dated looks, 1990's style edition of Angry Birds? Let us know via the T3 Twitter and Facebook feeds.